The DOT wants to add a two-way bike lane to Clinton Avenue, making it a one-way street. 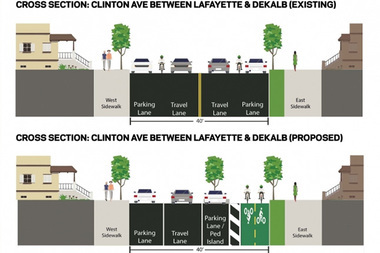 CLINTON HILL — Some locals are fighting a proposal that would add a parking-protected bike lane to Clinton Avenue and make it a one-way street, saying the new design wasn’t created to serve longtime residents. Several people questioned whether the Department of Transportation had consulted local groups before drafting the proposal, crying out “We don’t bike here” and “You’re not from around here,” at a packed town hall meeting hosted by District Leader Olanike Alabi Thursday night at the Teen Challenge Center. “Why is it that we pay astronomical land taxes and we’re constricted as landmark owners, yet outsiders like yourself can come in and dictate the nature, the look of our community?” asked one Clinton Hill resident, who declined to give his name. The DOT proposal would turn Clinton Avenue, now a two-way street, into a one-way northbound street between Flushing and Gates avenues, with one travel lane, a parking lane and a pedestrian island. Drivers would be encouraged to use neighboring streets, like Adelphi Street, Vanderbilt Avenue, Waverly Avenue, Washington Avenue and Hall Street, to go south of Gates Avenue. The change would have a minimal effect on the surrounding street network since Clinton Avenue has relatively low traffic, according to the DOT. But residents say they worry about traffic in an already congested section of the neighborhood. Many elderly residents also voiced their concerns about getting in and out of the neighborhood easily. “You’re trying to trap us in our neighborhood,” said one resident who told the town hall she's lived on Clinton Avenue since 1970. Esther Blount, whose family has owned her home on Vanderbilt Avenue between Gates and Greene avenues since 1936, said she and other residents don’t want to see the streets in their neighborhood change just to accommodate newcomers. Residents who live on surrounding streets say they fear diverted traffic will also make truck deliveries and access to emergency vehicles problematic. The DOT said it has sat down with the FDNY and the NYPD to plan emergency vehicle access on the street. “I don’t want anyone to leave this meeting feeling like an ambulance can’t get down the block to get to them,” DOT borough planner Abigail Ikner said Thursday. The DOT says the change would calm traffic, shorten pedestrian crossing distances and make the street safer for families, seniors and children. The DOT did not immediately respond to request for comment on traffic data for Clinton Avenue. A small group of bike lane supporters appeared at Thursday’s town hall, citing the recent deaths of cyclists Lauren Davis in Clinton Hill and James Gregg in Park Slope, and saying that protected bike lanes make the streets safer for everyone in the neighborhood. The DOT emphasized that the bike lane proposal has yet to go before Community Board 2 and is urging residents to give feedback through an online survey ahead of the vote. CB 2’s Transportation and Public Safety committee will review the proposal at a May 17 meeting that will also include a public forum for residents. The meeting will take place May 17, at 6 p.m., at Brown Memorial Baptist Church at 52 Gates Avenue.